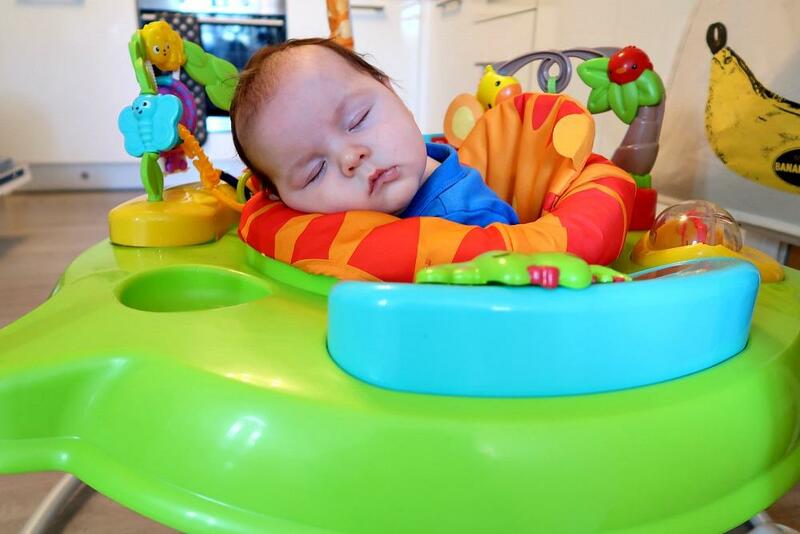 As I sit here on my comfy sofa to write this evening all three children sound asleep and the house so quiet I just cant get my head round the fact that my little tiny Arthur is already 4 months old, my Archie will be starting school come September and Sophia will be going into year 3. I feel like I need to wake myself up from some sort of dream where I must of pressed fast forward. I don’t know if it is a mix of getting older or just having three children but I feel like since Sophia started school someone has put my life on fast forward. I feel like I am in a rush to document all the moments and by the time I come to do so there are all these many new moments for me to document but I haven’t even got my head around the moments before. 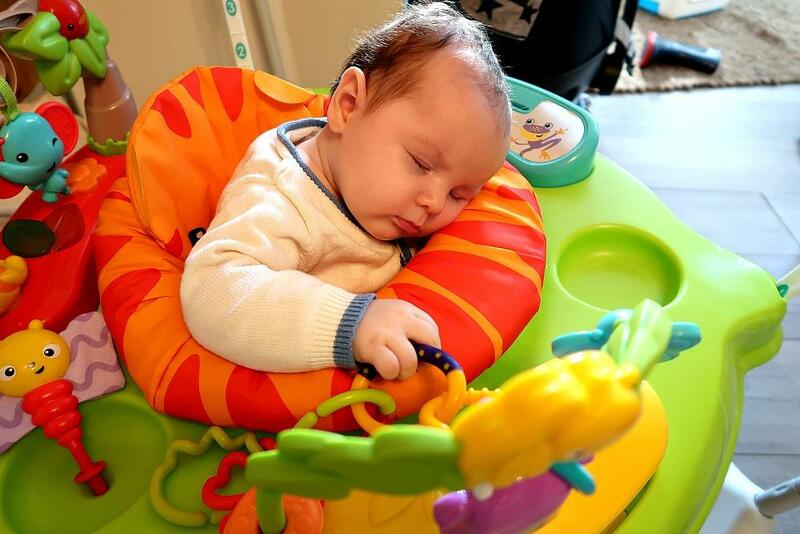 A few weeks ago before the start of the easter holidays, Arthur started doing this really cute thing. I would get home from the school run and start my usual morning routine of cleaning and sorting in the kitchen dinning area. (Its where I do my clothes washing too, so its a really busy area of our house) I would pop Arthur in his little jumperoo and I would get on buzzing around, clothes washing, loading the dishwasher, packing away our mess from the morning, wiping down the sides, taking the bins out, and I would turn around and find the sweetest sight I ever did see. 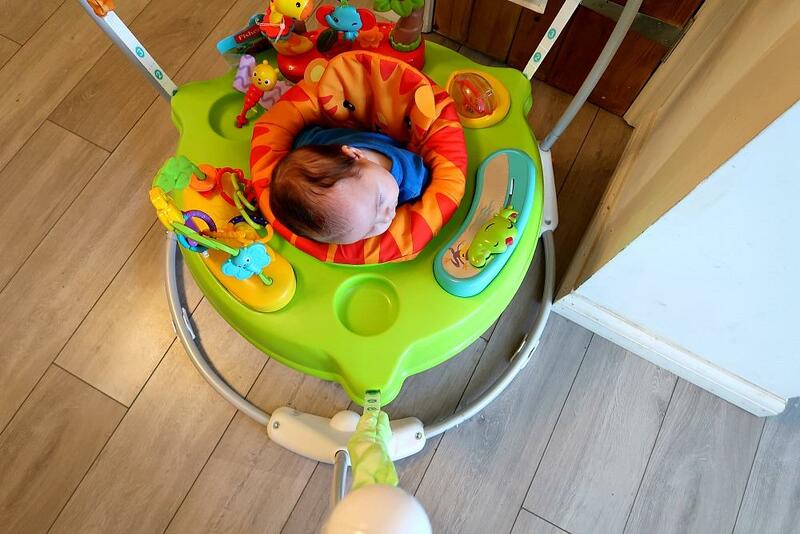 My sleeping baby, standing up fast asleep in his jumperoo. Sophia and Archie never fell asleep anywhere unusual really apart from their beds or the car. 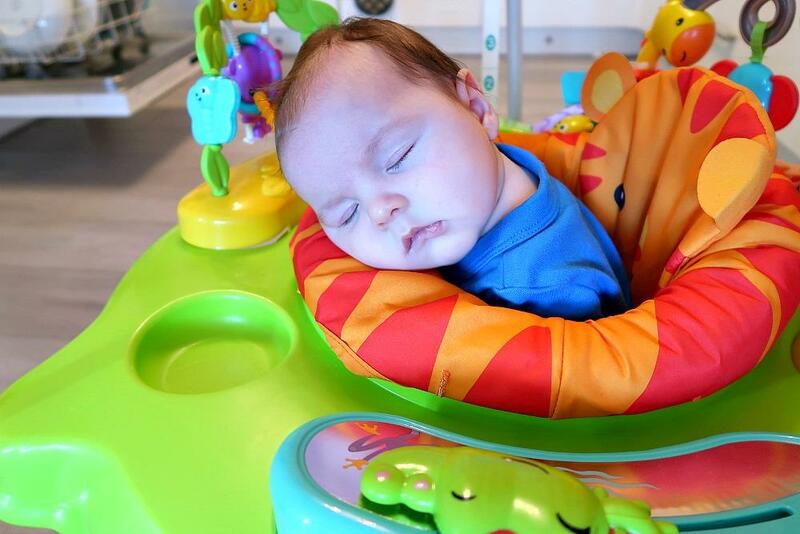 Arthur falling asleep in his jumperoo was the cutest thing I ever saw. I don’t ever want to forget it. The best part is that it wasn’t a one off and he has done it a few times now. 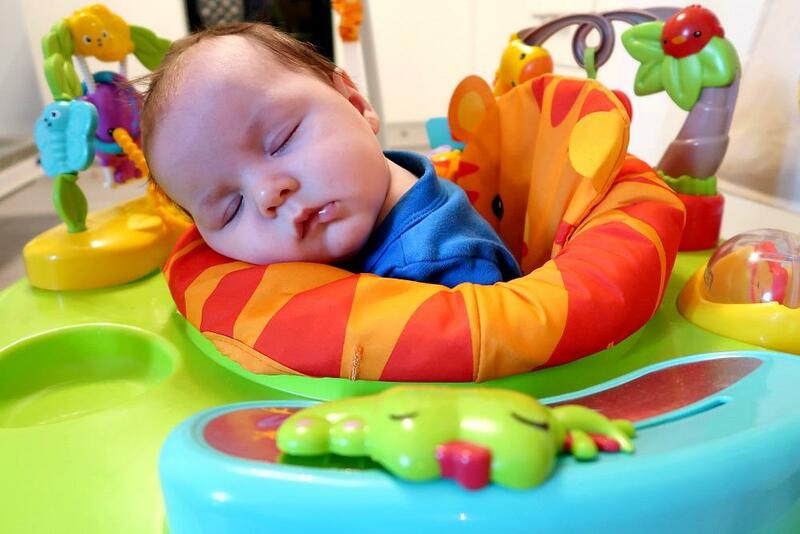 I think he must find it really comfortable because he never moans or gets upset, one minute he’s bouncing and I can hear him rattling his toys and the next minute its silent and I look over and his eyes are shut, sometimes with a finger in his mouth other times not. I found myself looking at him the other day, sleeping, so peacefully in his bed and I smiled to myself. He gives me the most warmest happiest feelings, my whole body feels warm just looking at him. Almost like my heart has doubled in size. He brings such a happiness into our home, such a sense of stability and security. And he has managed to come at the perfect time for our family. We all love him so much and all the milestones I have been through before with Sophia and Archie I seem to cling to even more with Arthur, one because he is our last (I think!!) and two because Sophia and Archie are here to see him go through them too. I like to tell them that mummy and daddy remembers them doing this when they were Arthurs age too. I love to tell them that they were once this small and mummy and daddy could hardly put them down in fear they would grow in a blink of an eye, and look they did! Sophia and Archie absolutely adore Arthur and its easy to see as they care and love him daily. It makes me so proud and so happy to have the three of them loving and caring for each other. I know I say it all the time but I am genuinely grateful for all the advice I had from my friends telling me that I may regret not having another baby but I will never regret having one more and how right they were. He has only added to our family and I look forward to watching him grow albeit I hope it wont be as fast as the last times. I still cant believe I have 7 year old Sophia and 4 year old Archie. It feels like I only became a mum yesterday. I have promised myself this time I am savouring every single minute and I really feel like I have. I have had 99% more good days then bad and I have loved becoming a mummy for the third time so much. I would also just like to touch on the fact that I feel very fortunate to feel this way and I know I am lucky because some mums don’t have an experience like this. I feel like I am so grateful because I suffered with pnd when I had Sophia and it was really quite bad. (really quite difficult for me to write that down and share it here on my blog I have a very large audience of family and friends who read my blogs and its quite scary putting this information out there but I am doing it because I am a real and honest person with real emotions and feelings just like us all). I want to be honest to my friends on here just like I am to my friends in my offline life too. I’ve not really talked openly about it and actually I think only a handful of people I know will know that but we are all well and in a very good place these days. Sophia is happy and healthy and so am I.
I would just like to say that it always gets better (if you find ways of working at making it better for yourself) and remember you are never alone in how you feel and to seek support in whichever form that is, there are so many options. I went down the natural route because I didn’t think conventional medicine or counselling would help me. I sort out the help I wanted and here I am today happier then ever. It was never a quick fix and it didn’t happen over night. It is not a one size fits all thing we are all unique and experience things at different levels and in different ways. All I know is that over the last 7 years of being a mum I have learnt so much about myself and looking back at those years and how far I have come as a person makes me feel really happy to be where I am today and really fortunate too. I know I’ve said it before or maybe I have just thought it but I really believe Arthur was sent to show me my own power as a woman and mother. From my pregnancy with him, to his birth and postpartum he has pretty much been a perfect text book baby I still feel like I am dreaming. It has been an overwhelmingly positive experience for me and it brings tears to my eyes and so much joy to have had this experience this time around. I feel so overly lucky because I know how utterly crap the other side of it can be. And I wanted to mention that here because I don’t want to come across as perfect because I am not. So if you ever wonder why I am always so thankful and so grateful for being a mum its because I know the hard times and the good times and having experienced both the dark and the light I know just how important it is to be thankful for all the good and all the happy times. Life has a funny way of showing you just how deserving you are of all the good, so ride with it and take all the good it throws at you, because I promise its supposed to be full of all the goodness always. My little heart-breaker turns 1! Children falling asleep on their own is such a huge boon!’ My nephew sings himself to sleep now that he’s 2 years old. I had to carry him all around the house to make him fall asleep before, You’re very lucky to have 3 beautiful children and also to document each moment!